Habitat for Humanity is an international nonprofit organization, commonly known for their domestic and international home building projects. However, they offer so much more than shelter to the more than 4 million people who have touched these homes. The “Christian housing ministry,” addresses issues of poverty around the world by partnering with community offices, from the United States to Thailand. Home recipients volunteer with community members to build their future homes, break the cycle of poverty, and participate in fiscal responsibility training. Through Habitat, more than 800,000 homes have been rehabilitated and preserved since 1976. Which makes Habitat the largest not-for-profit builder in the world. How did you first get involved with Habitat for Humanity? I first got involved with Habitat 3 years ago. It’s something my former boss had been doing for years, so he invited me to attend the Leaders Build in 2012 with him. From then, I have been going back every year. What is the story of your first build, and what kept you coming back? My first build, I actually did dry walling. It was a lot of fun to not only work with other professionals in the community doing something completely out of our comfort zone, but to work along side future homeowners. I volunteer with other organizations in the Rochester area, but this one is my favorite because they believe in a hand up not a hand out. During my first build I learned that the future homeowners not only have to help build their own home, but they also attend educational classes on how to maintain a home and continue to help build for other future homeowners. I remember the feeling I felt when I bought my first home, so to share in that excitement keeps me returning year after year. Was there anything special about doing a build with the iVEDiX team? What I felt was unique about our iVEDiX build was it gave us a chance to work with others that you don’t typically interact with on a daily basis. We laughed. We encouraged each other. All while doing a good deed and paying it forward. 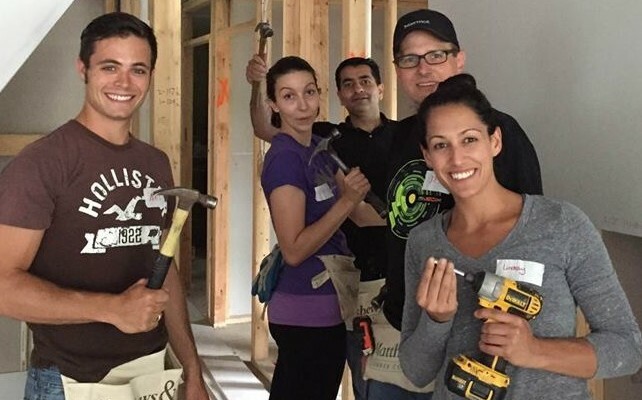 Will there be another build in 2016, and how can we support Habitat for Humanity? Let us know what organizations you support, and if you’re interested in learning more about our volunteer efforts in the comments.